Photographing fish can be extremely rewarding and a great way to celebrate memorable catches. These tips may help anglers take high quality fish photos. To successfully photograph fish in a variety of conditions, an angler must understand the basics of photography and be able to adjust camera settings. One of the best resources for novice to intermediate-level photographers is the camera owner’s manual or user guide. Most digital camera manuals not only explain basic photography terms, but also explain camera settings and offer advice on how to cure common problems. Most fish photography problems are related to lighting. By paying attention to conditions before a fish is landed, the photographer can anticipate problems and be ready. Essential preparations include charging or replacing batteries, cleaning the lens and doing a basic operational check of the camera before fishing. When landing fish, the angler may require equipment such as gripping tools, pliers, de-hookers, landing nets, gaffs, or other gear. A towel is also helpful for cleaning up after the fish is landed. Streams, lakes, and other habitats often have excellent areas on the shore for photographing fish. If the fish must be removed from the water, Look for shallow bottoms, aquatic vegetation, areas of moss, soft grass or other attractive backgrounds. Fish often display unique coloration when excited. Unfortunately, this usually lasts only a few seconds. The photographer must work quickly while the angler lands the fish. Fish that will be released must be handled with great care and returned immediately. Fish that are kept for the table should be treated humanely and chilled as soon as possible. Supporting the fish at the point if landing is important. Small fish can be supported by carefully cupping a hand beneath the fish and then lifting gently. Other fish may be held by the lip or restrained using a gripper tool. Some species must be led into in a landing net. In rare cases, such as sturgeon or monster catfish, the angler may even choose to enter the water and support the fish until it can be released. Holding fish up by the hook can injure or kill the individual. When possible, avoid having fish hang vertically on the line while anglers fumble for equipment. Digital photography is a great way to document species of fish. 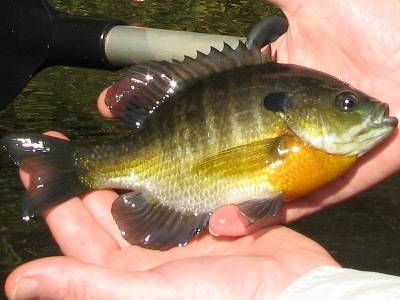 Photographs can help identify species while recording an unusual catch. Whenever possible, take several photographs, capturing the fish’s physical attributes.